In addition to our programme of courses we also organise events and opportunities for our members to showcase their work. As well as Artists' talks and the occasional film night. Take a look below to see highlighted events we have coming up, and also see our Events Calendar for dates of all events and courses. Join us over the late May Bank Holiday to view new prints produced by our Foundation and Diploma Students. Work by 19 printmakers will be on display and for sale. Themes include, interiors and architecture, nature and the wider landscape. 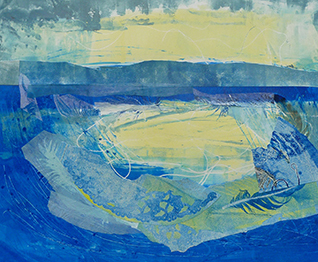 Framed and unframed works are available to purchase using printmaking techniques including, Screen printing, Linocutting, Etching and Drypoint. If you are thinking about enrolling on to The Foundation in Printmaking or returning to do The Diploma in Printmaking, this is an opportunity to come and talk to us and the students who have just completed these courses. Come and visit our wonderful exhibition of original prints by members of the workshop at Sir Harold Hiller Gardens - featuring some of the best printmaking in the region. Framed and unframed original prints and hand-printed greetings cards. All made by the artists and all for sale. Join Artist Printmaker Ali Yanya as he talks about his work and influences. Our Artist talks are always entertaining and informative giving an excellent insight into how a master printmaker approaches their work. This is also a great introduction to Ali and his work for people who are attending his weekend masterclass. Highly recommended!